Things are going great, and we are sticking to the plan. I really don't have anything different to say as far as the challenges and struggles for this month. The biggest changes we have seen as a result of the first six months of this debt freedom march is that we don't take our money for granted anymore. Before we met Joe we spent our money very foolishly and unconsciously. As a result, we are still paying for our past purchases today (aka: DEBT!). We appreciate our money now and make it a point to think about each purchase we make. I have to say, the march to debt freedom is one of the best things we have ever done. We have not accumulated any new debt and we are well on our way to paying off what we owe. I am very proud of my husband and myself and extremely thankful for Joe and his brilliant plan. We really started this year off right. As of right now we have a plan for just about everything; Christmas, vacation, vehicle maintenance, taking care of the yard for Spring & Summer, car insurance, car taxes, pet care, birthdays, holidays, etc. Knowing we have the money set aside to take care of the "known upcoming expenses" takes a lot of stress off of us each month. There are no surprises!! Overall, it feels great knowing we have a plan. This makes us feel in control of our money and our future. If there is anyone questioning whether or not to give Joe a call, please do not hesitate. If I had one regret it would be that we did not meet with Joe and start our journey to debt freedom sooner!!!!! My husband and I want to say Thank You to Joe for all of his encouragement and support. He has been a wonderful blessing to us and our future. God Bless You, Joe!! [BLUSH] I am humbled by the kind words that Couple #2 has shared. All I did was show Couple #2 the tools that I used to become financially free. They have taken it to heart, and I can not wait until I receive an invitation to their debt freedom party. My prediction is that this couple will be debt-free (except for the house) in 24 months or less. I know. I know. The Debt Freedom Date Calculation says 36.3 months, but I have seen way to many people who have had their IHHE Moment. They become debt-free way sooner than the calculation. Way to go Couple #2! 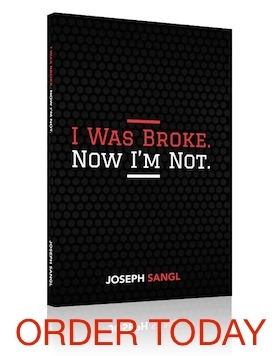 Everything I taught Couple #1 and Couple #2 and thousands of others is in my newly released book, I Was Broke. Now I'm Not. It can be purchased via PayPal or Amazon. It is NOT rocket science. I wrote this book in such a way that it can be read in less than 1.5 hours and can be immediately applied to your financial situation. Would you share with Couple #2 how their sharing of their personal financial situation is inspiring you?